The finished product topped with some additional fresh salsa on a corn tortilla! Planning a dinner that is quick and easy to throw together, healthy and actually tastes good can be a challenge at times. Okay, it can be a challenge most times! But I’ve really been getting creative with the crockpot! 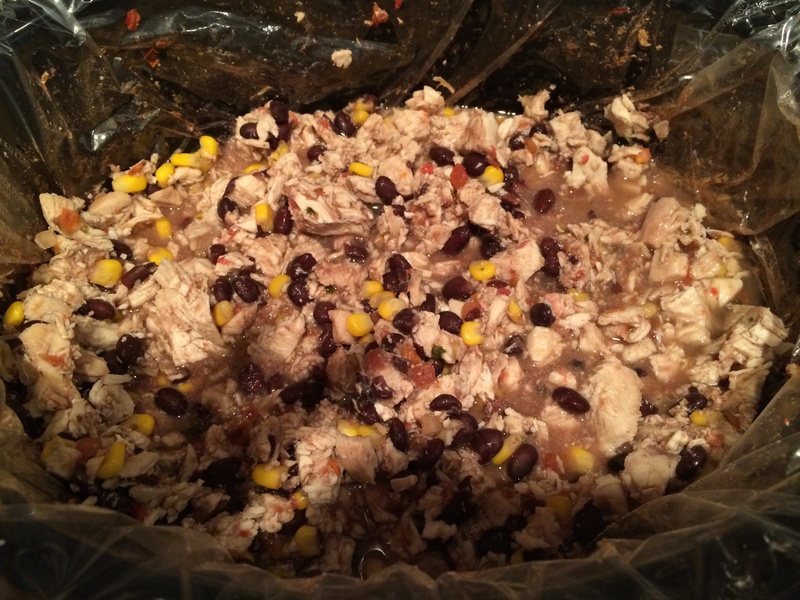 I love finding meals that can be tossed together in advance or even made ahead and frozen and then thrown into the crockpot to cook all day while I play and take of my kiddos! This meal has become a regular in our house and its hubby tested and kid approved! You can make as much or as little as you want and serve it multiple ways! 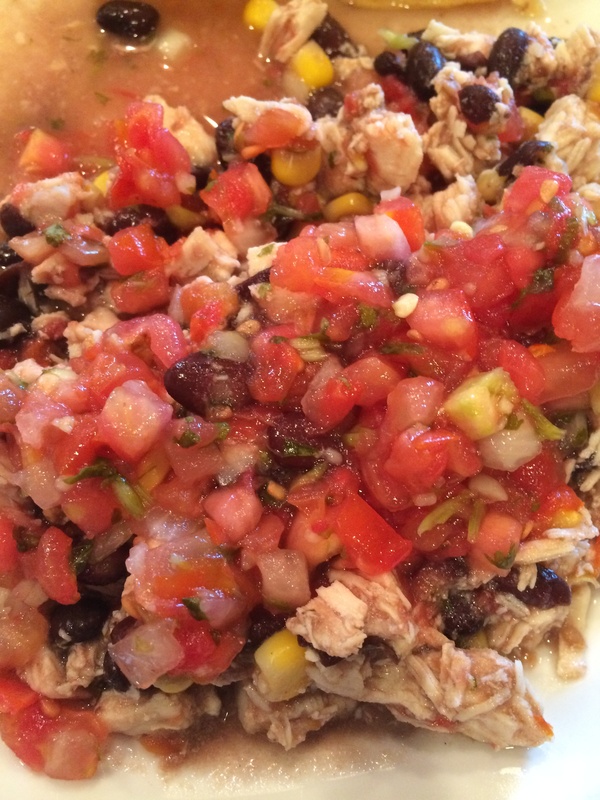 When finished cooking, shred chicken and serve alone, over rice, as a salad, with tortilla chips or in a wrap. Can be topped with sour cream, avocado and/or tomato or your favorite toppings! 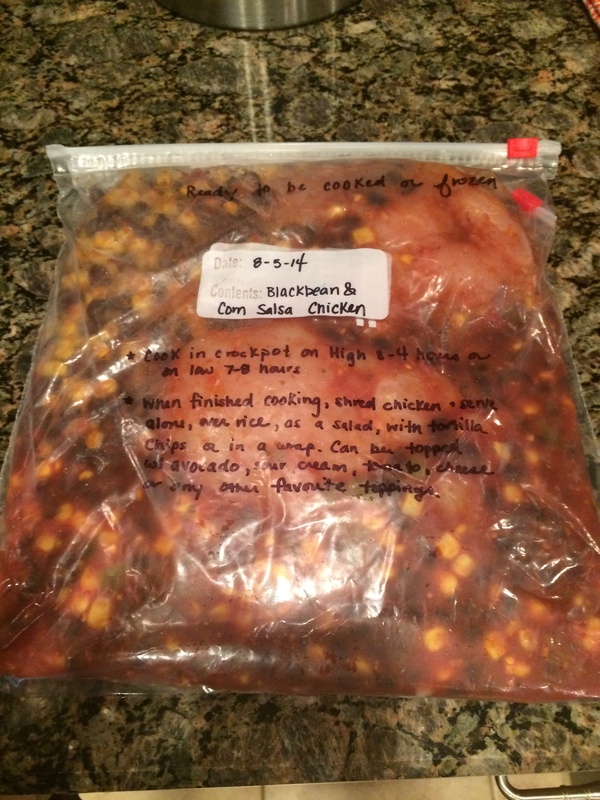 Follow the same steps as above but combine the ingredients in a ziplock freezer bag. Mix well. 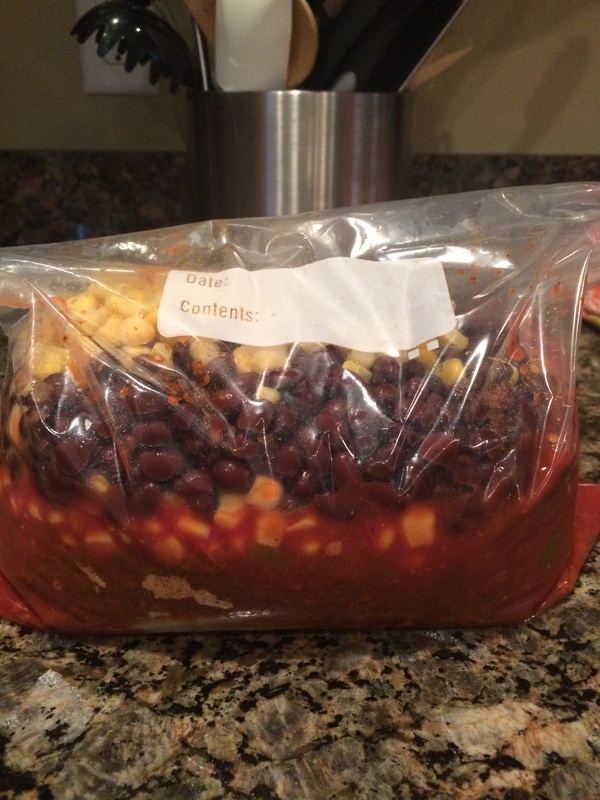 Remove all air from bag and place into another freezer bag labeled with name of meal and directions for use. 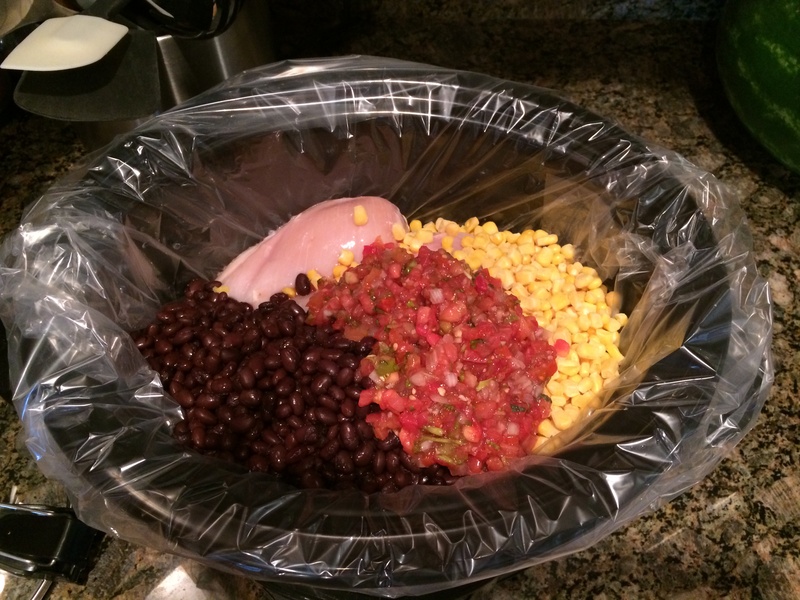 Note: I like to use the reynolds slow cooker liners making clean up even easier! Hi Carla – Exchange for what? The 21-day fix containers??? That was my question 🙂 Exchange for the 21 Day fix….. Yes of course – the Black beans and corn would be YELLOW the chicken RED and if you used jarred salsa it would count as a purple but I have found fresh salsas at my local grocery store that are made with diced tomatoes, peppers, onions and cilantro – so as long as there is no added sugar I count as a green. So in general – I would do 1 – 1 1/4 cups of the mixture and count as 1 Red, 1/2 Yellow, 1/4-1/2 Green depending on how much salsa you put in! If you put it with 1 corn tortilla you would have a full yellow and add is some steamed green beans or asparagus for some extra greens!!! How many 1 1/4 cup servings does this make? Its really going to depend on how many chicken breasts you make and how big they are. I would estimate at least 6 servings. If you freeze do you need to thaw first or can you cook frozen? I cook from frozen 🙂 That’s one of the best things with the crockpot!!! Hi this meal was delish!! Thanks! How many calories in the suggested serving? Hi this is so delicious! Just wondering how many calories in the mentioned serving above? I am following the 21 day fox measurements but I also like to track in my lose it app. Can’t wait to try it!!! How many lbs of chicken do you use? I get mine from a local butcher and they are HUGE, so just want to make sure I am using the correct amount. :). Thanks! It varies! I often make A LOT so I can have leftovers! I typically do about 2-3 pounds at a time. Just adjust the amount of salsa so it doesn’t dry out!!! Let me know what you think about it!! !